For those who are fans of Indian fiction, the name Ashwin Sanghi needs no introduction. In a country that's lost in a hundred variations of chick-literature and college romances since the start of this decade, his works stand out for being genuinely well-researched thrillers combining fact and fiction. He has been often described by readers as 'the Indian Dan Brown' which should be high praise... but I'll come to that point later. "Five thousand years ago, there came to earth a magical being called Krishna, who brought about innumerable miracles for the good of mankind. Humanity despaired of its fate if the Blue God were to die but was reassured that he would return in a fresh avatar when needed in the eventual Dark Age—the Kaliyug. In modern times, a poor little rich boy grows up believing that he is that final avatar. Only, he is a serial killer. In this heart-stopping tale, the arrival of a murderer who executes his gruesome and brilliantly thought-out schemes in the name of God is the first clue to a sinister conspiracy to expose an ancient secret—Krishna’s priceless legacy to mankind. Historian Ravi Mohan Saini must breathlessly dash from the submerged remains of Dwarka and the mysterious lingam of Somnath to the icy heights of Mount Kailash, in a quest to discover the cryptic location of Krishna’s most prized possession. From the sand-washed ruins of Kalibangan to a Vrindavan temple destroyed by Aurangzeb, Saini must also delve into antiquity to prevent a gross miscarriage of justice." For the record, I'm starting out with the key issue I and many others may have with this book just to get it out of the way. Try as you might, it's hard not to ignore the influence of 'the Da Vinci Code' and 'Angels and Demons' here. A professor of history and symbology... seals which need to be combined... a killer and antagonist who commit crimes in the name of God... it all seems too familiar to readers of Dan Brown. And that's a bit disappointing because it can undermine the efforts of the author. Having said that, this is a brilliantly researched book. We watch as Sanghi moulds the past and present together, blending vedic history and bits from the Mahabharata to events of the present day. There are certain concepts that he puts across, linking our country's most famous religions together which you would probably not have thought about previously. Much like in Dan Brown's religion based thrillers, here too we are offered new views of what we thought we knew as fact. We will view aspects of Hindu culture from an entirely different and unique interpretation. In spite of the constant jumps back and forth and from literal highs ( Mount Kailas ) to lows ( Dwaraka ), you don't lose focus. You don't get lost in the subplots and time-frames. The mystery - the key ( no pun intended ) to this novel is well done and will keep you intrigued to the end. It beings up some pretty controversial points too regarding certain famous monuments of India and does make you wonder about the history you learned. Conspiracy theory lovers are going to have a field day with this one. Is this Sanghi's best work ? No. I still give that title to Chanakya's Chant. 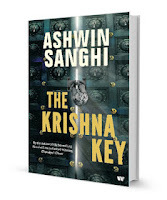 That book was just as brilliantly researched and perhaps, did not have to bear the cross this book does - of being 'inspired by'/'similar to' a more famous book ( the Da Vinci code ).More importantly, would I recommend the Krishna Key ? Without a doubt. The book is far superior to most of India's present day scenario. A well-fleshed storyline with thought-provoking facts about India's history, it is a definite 'buy' in my opinion. Thanks for stopping by.. have replied in email. Good review. . Chanakya's chant is definitely a good book. . But his other book The Rozabal line has too much of Dan Brownism in it and there are too many plots. . You would actually loose focus. . Soon i'll get my hands on this. .
apply for it via blogaddas book review.. you'll get a free copy to review.